In the early 19th century, the Johns Creek area was dotted with trading posts along the Chattahoochee River in what was then Cherokee territory. The Cherokee nation was a confederacy of agrarian villages led by a chief. After Europeans colonized the area, the Cherokee developed an alphabet, and a legislature and judiciary system patterned after the American model. By 1820, the community of Sheltonville (now known as Shakerag) was a ferry crossing site, with the McGinnis Ferry and Rogers Ferry carrying people and livestock across the river for a small fee. Further south, the Nesbit Ferry did the same near another crossroads community known as Newtown. In the 1820s, the discovery of gold in the foothills of northeast Georgia within the Cherokee Nation – approximately 45 miles (72 km) north of today’s Johns Creek – led to America’s first Gold Rush, the eventual takeover of the Cherokee Nation by the U.S. government in 1830, and the subsequent forced exile (the “Trail of Tears”) of Cherokee Indians to Oklahoma and other areas of the American West. A few Cherokees remained, the most famous being Sarah Cordery (1785–1842), the half-blood Cherokee wife of pioneer John Rogers (1774–1851), and their 12 children. Rogers was a respected, influential plantation owner and colleague of President Andrew Jackson. Rogers’s 1828 home – today, a private residence in Johns Creek – was an overnight stop-over for Jackson. Much later, the home was also visited by famed humorist Will Rogers, the great, great-nephew of John Rogers. Johns Creek’s name comes from John Rogers’s son, Johnson K. Rogers. A local tributary was named after him, and the name “Johns Creek” eventually came to be the name of the area. In 1831, much of the land in the former Cherokee Nation north of the Chattahoochee was combined into the massive Cherokee County. When Milton County was formed in 1858, the Johns Creek area was folded into it. In the 1930s, during the Great Depression, Milton County was dissolved and all of its land was then absorbed into Fulton County. The four main crossroad communities — Ocee, Newtown, Shakerag and Warsaw — remained the social, educational and business centers of rural, unincorporated northeast Fulton County. For the next 50 years, these communities helped bring a sense of identity to this largely undeveloped and underpopulated area, as the nearby cities of Roswell, Alpharetta, Duluth and Suwanee and adjoining Forsyth and Gwinnett counties continued to grow and develop. In 1981, a group of Georgia Institute of Technology graduates bought 1,700 acres (6.9 km2) of farmland and woods near McGinnis Ferry and Medlock Bridge Roads for a high-tech office park. The new office park was to mirror one built in 1970 in nearby Peachtree Corners, known as Technology Park/Atlanta. Spotting tiny Johns Creek on an old map, they named their mixed-use, master-planned community “Technology Park/Johns Creek”. This is the first reference to Johns Creek as a place. The area grew over the years to become the home of 200 companies – many of them Fortune 500 firms – with nearly 11,000 people spread over 6,000,000 square feet (560,000 m2) of office, retail and industrial space. With the jobs came houses and shopping centers, and the population increased to about 60,000. By 2000, a grassroots movement to incorporate the Johns Creek area into a city was slowly developing. Residents wanted more control over issues such as traffic, growth, development and quality of life. They also sought a level of service that was a challenge for the sprawling Fulton County to provide. Following the nearby city of Sandy Springs’ successful incorporation in 2005, a legislative campaign was started to incorporate the Johns Creek community. House Bill 1321 was passed by the state legislature, signed by Gov. Sonny Perdue in March 2006, and approved by the residents of northeast Fulton County in a July 18, 2006 voter referendum. In November 2006, the city’s first elected officials were voted into office, with the City of Johns Creek becoming official December 1, 2006. On November 16, 2015, with little warning and no public comment, the Johns Creek City Council unanimously passed a resolution opposing the expansion of a MARTA rail line into north Fulton County. Some residents of Johns Creek have voiced concerns around the lack public engagement on behalf of the council members. In 2017, an iHeartJC initiative has been growing to have the city’s residential, business and innovation ecosystem develop a long-term strength and identity in healthcare innovation and wellness. The City Council consists of a mayor and six council members who are elected at large, and serve four-year terms. Elections are staggered every two years. The effort to launch the city government was expedited by hiring CH2M Hill-OMI, a global, Colorado-based consulting firm that provided most day-to-day municipal services (except for police and fire) for the first three years of cityhood. The company provided equipment and staff so the city could be functional immediately upon the first day of operation. The public-private partnership, modeled after a similar plan in Sandy Springs, was one of the most extensive in the country at the time. Only the city manager, city clerk, city attorney, mayor’s aide, finance director, municipal court clerk and judge were city employees. Other staff was provided by CH2M Hill-OMI or their sub-contractors. As the city grew and matured, it reduced its reliance on CH2M Hill. In September 2010, the city council voted to revise its public-private partnership with CH2M Hill. Community development and public works operations continue to be provided by CH2M Hill, while all others are provided by city employees or other contractors and sub-contractors. The Johns Creek Police Department launched April 27, 2008, and the fire department launched October 27, 2008. The police department was certified by the Georgia Association of Chiefs of Police and accredited by the Commission on Accreditation for Law Enforcement within two years of the department’s formation. In the November 5, 2013, election, the incumbent mayor, Mike Bodker, won the election against his opponent Bev Miller. In the same election, Lenard “Lenny” Zaprowski defeated incumbent Randall Johnson for Post 1 on the City Council. Later that year, a runoff election was held for Post 3 between Cori Davenport and incumbent Karen Richardson, with Davenport winning. For post 5, incumbent Kelly Stewart ran unopposed. Johns Creek is located in northeastern Fulton County and is centered at 34°1′44″N 84°11′55″W (34.0289259, -84.1985790). The elevation ranges from 880 feet (270 m) above sea level along the Chattahoochee River to 1,180 feet (360 m) in the Ocee area along the Alpharetta border. Johns Creek is bounded to the south by the Chattahoochee River and Gwinnett County, and on the northeast by McGinnis Ferry Road and Forsyth County. It is bounded by Roswell to the west, Alpharetta to the northwest, Suwanee to the east, and Duluth, Berkeley Lake, and Peachtree Corners to the south. Downtown Atlanta is 27 miles (43 km) to the southwest. According to the U.S. Census Bureau, the city of Johns Creek has a total area of 31.3 square miles (81.0 km2), of which 30.7 square miles (79.6 km2) is land and 0.54 square miles (1.4 km2), or 1.76%, is water. According to the 2010 U.S. census, 76,728 people live in the city of Johns Creek, a 27.1 percent increase since a 2000 estimate for Georgia’s 10th largest city. The racial makeup of the city in the 2010 U.S. census was 63.5 percent White; 23.4 percent Asian (8.4% Asian Indian, 6.5% Korean, 5.7% Chinese, 0.5% Vietnamese, 0.5% Japanese, 0.5% Pakistani, 0.4% Filipino, 0.1% Bangladeshi, 0.1% Indonesian, 0.1% Thai, 0.1% Cambodian, 0.1% Laotian); 9.2 percent African American; 5.2 percent Hispanic or Latino of any race (1.6% Mexican, 0.8% Puerto Rican, 0.7% Colombian, 0.4% Cuban, 0.2% Peruvian, 0.2% Dominican, 0.2% Venezuelan, 0.1% Guatemalan, 0.1% Honduran, 0.1% Salvadoran, 0.1% Chilean, 0.1% Argentinean, 0.1% Ecuadorian, 0.1% Spanish); 0.1 percent Native American; 1.4 percent from other races; and 2.4 percent from two or more races. Johns Creek’s 2010 demographics showed an estimated $109,576 median household income, a $137,271 average household income and a $45,570 per capita income. Johns Creek has metro Atlanta’s only part-time, fully professional symphony orchestra, the Johns Creek Symphony Orchestra. Under the leadership of Music Director J. Wayne Baughman, the orchestra performs several times each year. The Johns Creek Arts Center offers classes and camps for aspiring artists in multiple media throughout the year. There also are several festivals year-round, such as Founders Week in December in which the community celebrates the city’s incorporation with activities and a parade. The Fall Family Festival in September is a community get-together at Newtown Park. 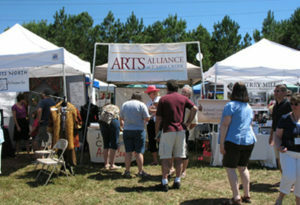 Arts on the Creek is a juried art show, and also has musical and stage performers. “The Taste of Johns Creek” is an annual food festival in the fall that features more than 40 local restaurants with proceeds supporting public school extracurricular activities. There are six golf facilities (five private, one public) in Johns Creek, including the renowned Atlanta Athletic Club, home of the 2011 PGA Championship and the 2014 U.S. Amateur. Other golf facilities include Country Club of the South, Rivermont Golf and Country Club, River Pines Golf, St. Ives, and The Standard Club. The Atlanta Athletic Club was the site of the inaugural Atlanta Tennis Championships in 2010. Johns Creek is home to thousands of members of the Atlanta Lawn Tennis Association (ALTA), one of the largest and oldest organized recreation leagues in the country. Johns Creek, which is bordered by 13.5 miles (21.7 km) of the Chattahoochee River, has multiple nearby spots where paddlers can put in or take out their boats. It has shoals and low-level rapids. It also offers prime trout fishing. Autrey Mill Nature Preserve and Heritage Center offers a replica of a Creek Indian hut, an 1800s historic village, and wildlife in 46 acres (190,000 m2) of woodlands. Biking the 4-mile (6 km) Greenway along Georgia 141 is a popular pastime. The city has plans to develop and connect other pathways to the Greenway, which will tie in with other cities, adding several miles of trails. The public schools in Johns Creek are part of the Fulton County School System and not funded by the city. Johns Creek’s public schools consistently place among the top in the nation. Chattahoochee High School, River Trail Middle School, and Dolvin Elementary are National Blue Ribbon Schools of Excellence. Northview High School has three times won the Governor’s Cup for the state’s highest SAT scores. Centennial High School, located in Roswell, serves students who live in Johns Creek. Haynes Bridge Middle School, located in Alpharetta, serves students who live in Johns Creek. Hillside Elementary School, located in Roswell, serves students who live in Johns Creek. Northwood Elementary School, located in Roswell, serves students who live in Johns Creek. Atlanta-Fulton Public Library System operates the Northeast Spruill Oaks Library and Ocee Regional Library.